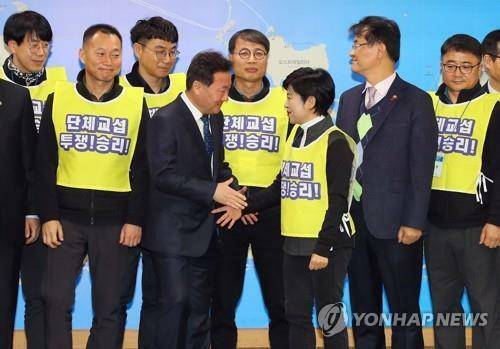 SEOUL, Jan. 21 (Yonhap) -- The South Korean government and unionized civil servants have concluded their collective bargaining after 11 years of on-and-off negotiations, officials said Monday. The Ministry of Personnel Management and representatives of 74 civil servant unions that represent about 230,000 government employees signed their first collective bargaining agreement since 2007 at the Sejong Government Complex in the morning. The government's first collective bargaining agreement was signed in 2007 during the administration of liberal President Roh Moo-hyun, but the next negotiations that began in 2008 between the government and civil servant unions were halted the following year during the presidency of conservative Lee Myung-bak. Their negotiations resumed in December 2017 after the inauguration of liberal President Moon Jae-in. The 74 civil servant unions include the Federation of Government Employee Unions and the Korean Government Employees' Union. The latest agreement calls for establishing and operating a civil servant labor-management conference to discuss working conditions and welfare improvement for government employees. Both sides also agreed to continue to hold negotiations to "reasonably" improve the compensation, payment of allowances and education for civil servants. In addition, the agreement calls for making greater efforts to promote the culture of gender equality at workplaces and prevent sexual harassment and violence. Hwang Seo-chong, the personnel management minister, said civil service labor and management will further join hands to offer better administrative service and gain public trust.